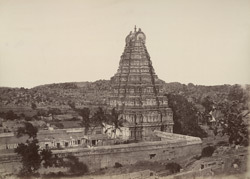 Photograph showing the large gopuram (tower) of the Virupaksha Temple, at Vijayanagara in Karnataka, taken by William Henry Pigou in 1857, from 'Architecture in Dharwar and Mysore'. Vijayanagara, the City of Victory, was the seat of a powerful Hindu kingdom in Southern India from 1336 to 1565. The kingdom was founded by two brothers, Harihara and Bukka, formerly chieftains with the Delhi Sultanate. Vijayanagara flourished as a prosperous centre of Hindu art, culture and architecture, until the Battle of Talikota in 1565 when it was defeated by the armies of a coalition of neighbouring Muslim kingdoms, its rivals for supremacy in the Deccan. The ruins of this vast royal city on the bank of the Tungabhadra River lie surrounded by granite hills. The site is also known as Hampi, together with a small local village nearby. In its heyday, with its strategic setting which was both spectacular and with good natural defences, the city was an influential centre for trade, especially in Arab horses and spices, and welcomed foreign travellers who left accounts of its grandeur. Its plan consisted of a number of zones, the sacred, the urban and the royal. The Virupaksha temple lies to the west of the palace enclosures and is sacred to a form of Siva. It is also called Pampapati, or Consort of Pampa, after the local goddess Pampa who was identified with Durga/Parvati, Shiva's spouse. The cults of Pampa and Virupaksha are an indigenous tradition which predates the establishment of Vijayanagara, and survived the destruction of the city. The Virupaksha temple, 13th to 17th century, is the only sacred complex still used for worship, with an annual festival celebrating the marriage of the deities drawing thousands of devotees. The complex includes pre-Vijayanagara shrines, two gopurams or temple towers, the taller of which was erected by the illustrious Krishnadevaraya (ruled 1509-29), and the other being renovated in the 17th century.